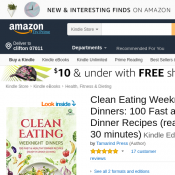 Clean Eating Weeknight Dinners: 100 Fast and Healthy Dinner Recipes (ready in under 30 minutes) Kindle Edition for Free. Be inspired by this recipe collection, which has been specifically designed to help you out during your busy working weeks, to discover new easy dishes for you and your family. Each recipe is based on fresh vegetables, fruits and “real” ingredients, that can be mixed in thousands of different combinations of flavors to create delicious and light meals. You will find fresh salads for summer and hot soups for winter days, but also several main courses (with also lots of meat and fish, for non-vegetarian people!) and snacks, to match all your personal preferences. These recipes are very simple, which makes them suitable for people who are not used to cooking much, but are eager to improve their diet: you’ll find out that healthy meals won’t make you give up taste, but they’ll let you discover more authentic flavors!